HandKrafted by Stephanie: Hi there! Hi there! A few weeks ago, I was browsing through the Whipper Snapper store in search for some lamb and sheep stamps, and I discovered a whole new (to me) area. I had only been looking through the cling mount sets and only just found there are many single image and sentiment stamps. I checked out the farm animals section and found several adorable sheep... this is one of them ~ Autumn Sheep. I think my SIL, Mary (who is a big fan of everything lamb and sheep), will smile when she sees this image! Since my "Happy Harvest" card didn't bring the good fortune that I had hoped it would, I thought maybe a simple "Hi there" will help to bring a bountiful harvest (and slow down the rain and cold weather). 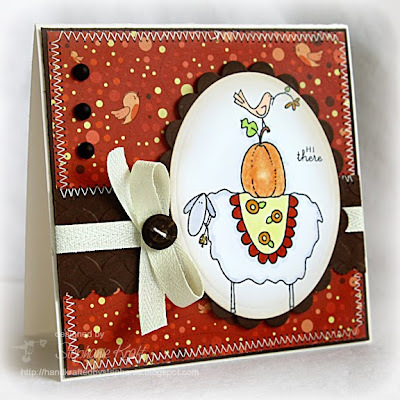 I used Mercy's Tuesday's Sketch Challenge, MTSC46, and paired it with some Cosmo Cricket, Nutmeg, patterned paper. And, even though my SIL and BIL don't harvest pumpkins, I thought this image was too cute to pass up sending on! Accessories: Oval and Scalloped Oval Nestabilities (Spellbinders), Retro Diamonds embossing folder (Quickutz), Scalloped scallop border punch (EK Success), Markers (Copic), Prismacolor pencils, OMS, Gold stickles (Ranger), Candy dots (Pebbles), Ribbon, Button (Papertrey Ink), Twine (May Arts), Foam tape, Thread, Sewing machine. Super cute image!! Love your card! That image makes me laugh! Your card is so beautiful! stephanie...this is wonderful! L-O-V-E that image, and your colors are superb!